(Phys.org) —Mathematician Yitang Zhang of the University of New Hampshire, appears to have taken a major step in solving the twin prime conjecture. He's come up with a mathematical proof that shows that the number of pairs of prime numbers that exist that are less than 70 million units apart is infinite. His proof is currently under review for publication in the journal Annals of Mathematics. The twin prime conjecture has puzzled mathematicians for nearly as long as they have known of the existence of prime numbers (whole numbers divisible by themselves and one)—going all the way back to Euclid. An interesting aspect of prime numbers is they come farther and farther apart as more are found—except sometimes, they don't—sometimes instead, they come in pairs: 11 and 13 for example, or 41 and 43. The twin prime conjecture states that there are infinitely many pairs, but no one has been able to prove it. The closest anyone has come is when a team of three mathematicians demonstrated back in 2005 that the number of prime pairs that differ by only 16 units is infinite. The problem there was that it was based on another unproven conjecture. In this new work, Zhang has shown, using nothing but standard mathematical techniques that the number of pairs of prime numbers that exist that are 70 million units apart, or less, is infinite—sans unproven conjecture. Mathematicians note that 70 million might seem like a lot to those outside the field, but inside the field, it's a tremendous breakthrough. This is because it proves that the size of the stretches between pairs doesn't keep growing larger forever—a baseline exists—a baseline that could very well be reduced to a smaller number, though no one is yet suggesting it might ever come down to just 2. Zhang has said in interviews that the idea for his proof came to him while he was visiting with a friend last summer. He's been working on it ever since. And now that he's made his proof public, other mathematicians have been reviewing it as well, and thus far, no one has spotted any problems with it. Great stuff! I have a hunch that unraveling the mystery of prime numbers will lead to a major breakthrough in physics... particularly with regards to singularities.... perhaps even the big bang itself. Simply by asserting a unit, a "one" of something, a complex unpredictable pattern arises. Numerical singularities are not identical to physical space/time ones: "The question of the validity of the hypotheses of geometry in the infinitely small is bound up with the question of the ground of the metric relations of space. In this last question, which we may still regard as belonging to the doctrine of space, is found the application of the remark made above; that in a discrete manifoldness, the ground of its metric relations is given in the notion of it, while in a continuous manifoldness, this ground must come from outside. Either therefore the reality which underlies space must form a discrete manifoldness, or we must seek the gound of its metric relations outside it, in binding forces which act upon it. The answer to these questions can only be got by starting from the conception of phenomena which has hitherto been justified by experience, and which Newton assumed as a foundation, and by making in this conception the successive changes required by facts which it cannot explain. Researches starting from general notions, like the investigation we have just made, can only be useful in preventing this work from being hampered by too narrow views, and progress in knowledge of the interdependence of things from being checked by traditional prejudices.This leads us into the domain of another science, of physic, into which the object of this work does not allow us to go to-day." Riemann "On the Hypotheses which lie at the Bases of Geometry." I have a serious doubt on this proof: the un-proven conjecture would be the same Riemann conjecture, but this was proven and also today not well knowed! REPEATing, I have a serious doubt on this proof: the un-proven conjecture would be the same Riemann (and Gauss for prime numbers) conjecture, but this was proven and also today not well knowed! We'll start with an analogy, the Prime Numbers between 1 and 100. They're 2, 3, 5, 7, 11, 13, 17, 19, 23, 29, 31, 37, 41, 43, 53, 59, 61, 67, 71, 73, 79, 83, 89 and 97. A pair of Prime Numbers is any two consecutive Primes, so (2,3) and (43,53) are pairs. Notice how some primes in this list are pretty close together, and some are rather far apart. 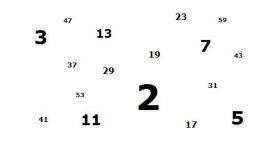 (3,5), (5,7), (11,13), (17,19), (29,31), (41,43), and (71,73) are all separated by only 2. There's 7 pairs of Primes less than 100 separated by only 2, 6 of those are less than 50, 4 of those are less than 25, and 3 of those are less than or equal to 13. Between 100 and 200, there's 6 such pairs, and they're more spread out. 3 of them are less than 150, one pair straddles the halfway mark (149,151), and two more pairs live between there and 200. An old conjecture was that, as you moved up the number line, you'll still encounter pairs of Primes separated by only 2. They'll get rarer and rarer, but keep going long enough, and eventually you'll get to the next such pair. There will always be a next pair of Primes separated by only 2, even if the next pair is hundreds of billions of trillions of numbers away from the previous closest Prime number. That's the old conjecture. What this guy has claimed to prove is close. He's proved that there's always a next pair of Primes that's separated by less than 70 million. No matter how far you get along the number line, eventually you will run into a pair of Primes that are separated by less than 70 million. Now, you might have to travel really far along the number line to get there between similar such pairs, and eventually when you get really, inconceivably big, you will have to travel really far between such pairs. But as long as you keep going up the line, you'll get there. Thrasymachus: Thank you. I believe I understand. If I am not mistaken, Zhang's proof indicates that no matter how far "out" one goes on the whole number line, there will be be a pair of prime numbers (two primes separated by no more than one, such as "3 and 5") separated by no more than 70 million units. So, in other words, if an "ultra-super" computer got way out to, say, the google number, one could be certain to find a pair of primes separated by no more than the "measly" 70 million. From what little I know about prime numbers, that seems hard to believe. It will be interesting to find out what other mathematicians have to say after they have thoroughly scrutinized Zhang's proof.